Be the first to share your favorite memory, photo or story of CLOVIS. This memorial page is dedicated for family, friends and future generations to celebrate the life of their loved one. 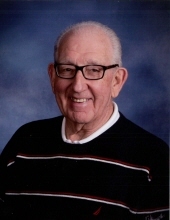 C. Dale Curry, age 81, of Republic, passed away on Friday, January 18, 2019, at University Hospital, Columbia Missouri, after a brief illness. Dale was born January 10, 1938, the son of Harley and Ida Curry, who precede him in death. Dale worked for twenty years at Dayco, serving as Plant Manager in Fort Scott, Kansas. He was President of Rotary International, President of the Chamber of Commerce, President of the Fort Scott Community College Endowment Board and served in many additional community groups. Dale completed his MBA at Drury University, where he later taught. He served in the Army and was deployed to Korea. He was an active member of the Calvary Baptist Church in Republic, where he assisted in numerous elementary Sunday School classes. After retirement, Dale golfed in all 50 states with good friends and regularly attended his grandchildren’s games and events. He planned and organized social gatherings with friends and family on a regular basis and he will be deeply missed by all who knew and loved him. Dale is preceded in death by his sister, Delores Blevins. He is survived by his three children; Deana Connell and husband Ron, Matt Curry and wife Rebecca, Marla Condon and husband Chris, and longtime love of ten years, Jane Smith. He was the beloved granddad to nine grandchildren and one great grandson. To send flowers or a remembrance gift to the family of CLOVIS DALE CURRY, please visit our Tribute Store. "Email Address" would like to share the life celebration of CLOVIS DALE CURRY. Click on the "link" to go to share a favorite memory or leave a condolence message for the family.